I don’t know who Sue is, but I have her sewing box. It came with one of the vintage sewing machines (the 15-91, I think). I’m trying to organize my office/sewing room, which right now looks approximately as though a bomb went off in it. I’m starting by trying to organize and consolidate supplies and tools and bits and pieces that are currently spread out over random boxes. But I don’t know what to do with this box now that I’ve emptied it. It’s not my style, but I’m having a hard time pitching it. Since I didn’t know Sue, I couldn’t say how much of this is true and how much is just a story I made up in my head. What I do know is that she’s most likely deceased since this came from an estate auction and that I now own her sewing machine and assorted supplies. 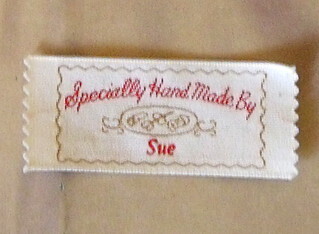 And that she did a lot of sewing, so much that she had labels made up. And that one time she went on a trip to New York. While she was there, she shopped on Fifth Avenue. Maybe she bought lots of things; maybe she just window shopped. She went into a store called Genny (I wasn’t familiar with the name, but the New York Times says that in the 1970s to early ’90s Genny “was an Italian label you could rely on for structured tailoring that felt like sportswear”) and she bought something that came in a lovely little bag. She saved that bag as a souvenir from her trip, brought it home, carefully cut it apart and wrapped a shoebox with it and used it to store her sewing supplies — hand needles, machine needles, spare bulbs and belts, little screwdrivers, presser feet, a crochet hook or two, you know the drill. 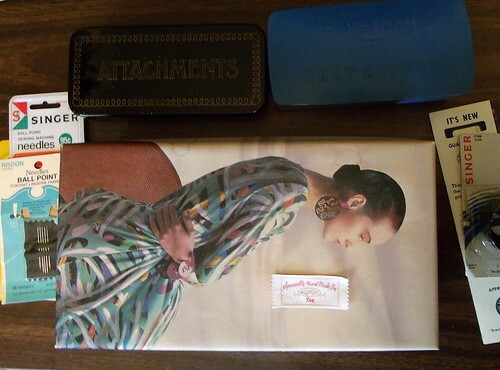 There was also an old enameled Singer attachment box in there and some other stuff — an elephant applique, some little bouquets of silk flowers. It’s slightly the worse for wear, a few bits of water damage, but in surprisingly good shape considering it might be 30 years old. It’s absolutely not my style at all, and ordinarily I wouldn’t keep it. 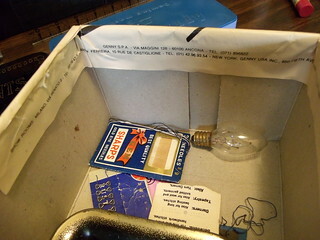 But it’s proving a little difficult to throw away this thing that someone I never even knew clearly cherished so much. In other news: There was a road trip today! Up in Holmes County (Amish country) there’s a great big fabric store called Zinck’s in Berlin. 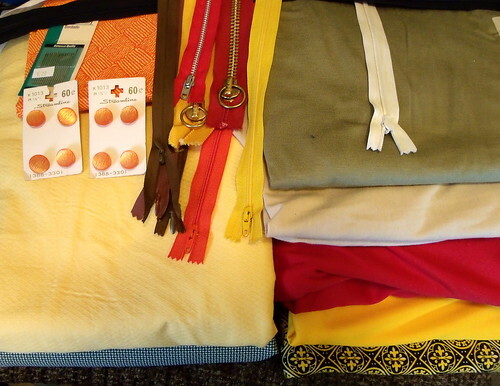 They have a stunning amount of fabric, not to mention buttons and zippers and things, all of it surprisingly inexpensive. All I really knew about them beforehand was that they have a huge store and sell a lot of fabric to the Amish, so I wasn’t sure if I was going to find a warehouse full of broadcloth in subdued colors. Which yes, they had a lot of, but they had a crazy amount of stuff. I maybe bought a few things while I was there. There was an entire huge bin of buttons with vintage looking packaging. Maybe ’60s or ’70s, based on the prices? All of them 50¢ a card. I could easily have bought my weight in buttons, but I held back and bought a couple cards of those pretty orange ones. And zippers! Since I didn’t have anything in particular in mind for the zippers, I didn’t go too crazy (though you might think otherwise seeing that pile). The short-ish ones were all four for a dollar, and the long 24″ ones, which I appear to have cropped out of the photo, were $1.29 each. Score! Right now I’m prewashing fabric. Can’t wait to start sewing it up!